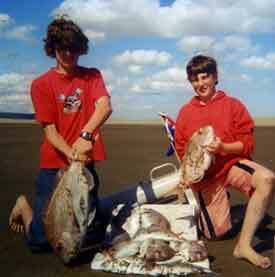 Peggy and Paul Barnes will be doing kite fishing demonstrations on the east coast this weekend at Tokerau Beach. Come along to our free demo and you may get a fish to take home! We will be using numbered traces so that attendees can bait a trace and then keep anything caught on it. So bring a chilly bin in case you get a fish on your trace. Fishing will commence at 9.00am on both days. It looks like we will have light to moderate westerlies for both days so we will be demonstrating both large and small dropper rigs, inflatable and conventional fishing kites. We also hope to test a new gadget for keeping mainlines well clear of the water on dropper rigs. 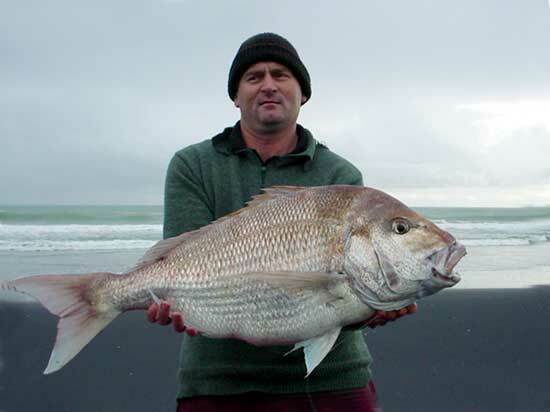 According to recent reports good fish have been taken in the area recently and while East Beach is probably fishing better, we decided on Tokerau Beach for the demos because you dont need a four wheel drive vehicle to attend. Drive up State Highway 10 towards the Karikari Penninsula, around two miles up the road take a right into Ramp Road. You will find plenty of parking at the end of the road and we will be fishing in front of the carpark. Hope to see you there! If the weather changes from southwest wind ring Tenga from Kaitaia Air and Tackle to check if the demo has been moved to another beach. He can be reached at his shop on Ph 09-408-3336 or Mob 021-812-266 after hours. Peg and I will be available on mobile Ph 027-665-9999. Tenga will also post a map and details on the window of his shop at Kaitaia Air and Tackle, North Road, Kaitaia. Ray did 2 sets on Friday, May 14th and returned 17 snapper ranging in size from 5 to 8lbs. 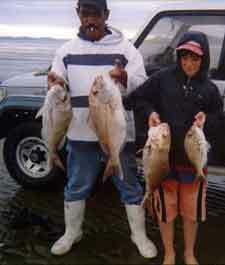 Ray's first set was using mullet for bait and the second set with Kahawai which had been caught on the first set. 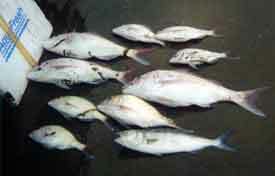 According to Ray, most of the snapper were taken on the second set with the fresh kahawai bait. 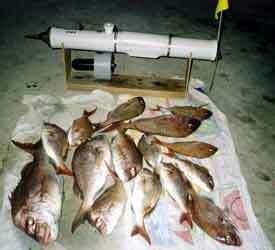 Fishing has been improving and the bigger snapper seem to be arriving in good numbers. 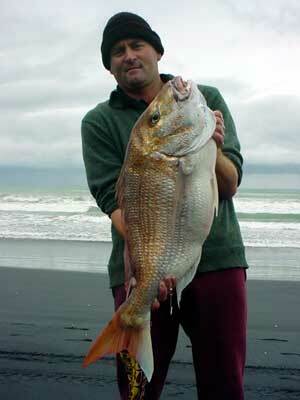 I did my first demonstration in late April and got some nice snapper up to 7kg and a few at 3 to 5kgs. Plenty of gurnard are being landed too but also quite a few grey sharks which, by the way, are good eating. Ross set 25 hooks on his kite powered bottom long line rig off the Mokau Coast on 22 May. Ross uses a power chute kite. We left the gear to fish for two and a half hours. The sea conditions were reasonably flat with drizzly rain. Bait used was fresh squid. 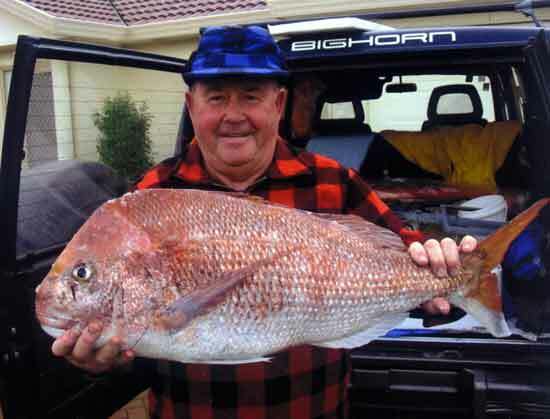 The catch was only two snapper - one being just legal which was released back into the sea and the other one weighed in at 10.04kg. Not a lot of fish around on that day but this one was enough to put smiles on our faces! Ed Usually when readers send in pics we get several photos of a good fish and pick the best one for the newsletter or Fishing News magazine. We included these three of Ross Clements with the same fish because all are very good pictures of fish and worthy of mention. Often people catch a great fish and then skimp on the photo session by taking only one shot or set the pic up with a cluttered background. Then when the pics get developed they are dissapointed. When you catch that fish of a lifetime or have great lighting or background take plenty of shots, who knows you may just get that magic shot and wind up on the cover of Fishing News or win our photo contest! The five photos (top, right and bottom) show what we were catching on our fishing torpedo at the top end of Muriwai Beach over the three weeks leading up to Easter weekend. We used squid and fresh kahawai for bait and all sets were done with the electric kontiki. We used Target Snapper Hooks on all the traces. Ed: Anyone considering using an electric kontiki on the west coast should be aware of the risk of sharks biting through the mainline. It is understandable that with fantastic catches like these available, some people will be prepared to take the risk. If you are one of them make sure to use small baits and not encourage the sharks with bloody baits like big chunks of bonito and the like. Don't leave the gear set too long either, if the gurnard are about you will have a line full in no time and their struggles will also attract sharks to the line. Sets of half hour or less are safest. I released all but the gurnard which was easy with target hooks. The shark and stingray were both small. Hi Team, I fished my flexiwing rig baited with mulet two kilometers up from bike park in 10-15 knot north easterly winds. The first six hook set took half an hour to get out to 800 meters. I left it to fish for 20 minutes. The first set caught two snapper and a gurnard, two baits were not even touched. The second set of seven hooks went out quicker as the wind strenth had increased. I left it out for 35 minutes. On bringing the kite back in I found two hooks bitten off but had caught 4 nice snapper and a kahawai on the flasher rigs I use on the very end of the hook section. So all in all it was a very pleasant afternoon and good too see the fish are still about in resonable numbers. Occasionally we get requests on how to use a kite rig single handed, I have copied a reply to one of these requests so others may benefit from it. I do not always have someone to go fishing with, and as the beach reel really requires another person to wind in the line, I have been wondering how to make the system a totally solo one. I have seen second hand Penn Senator 9/0 reels for sale at between $150-200. If I bought one of those, I would still need a rod to go with it. What would you recommend? Also, would I still have a problem using a rod and reel, as it is necessary to let out kite line when retrieving the dropper line (and hopefully the fish) and this must require 2 people also. What line should I use on the Penn reel, I would appreciate your comments. I use the flexiwing single handed from either the beach reel or my penn 9/0 with no problems. Haul the line hand over hand while shuffling sideways up the beach until you have hauled about 80 meters of line in. Then take two or three strides forward while continuing to haul the line and begin to shuffle sideways back towards the reel while still hauling the line and dropping it on the beach forward and clear of the first bit of line you hauled. When you get back to the reel wrap the line around your hand an wind the 160 meters of line laying on the beach onto the reel. Repeat this until the three way shock cord is retrieved. At this point release the ratchet on the reel and pull the drop line in to the bottle. While you are doing this the kite will lift the kite-line and drop-line from behind you as the mainline comes back off the reel and the kite gains altitude. Get the chilly bin and bait, then walk along the hook section while removing fish and old baits and re-baiting the hooks if you are doing another set. Take the chilly bin back to the reel, release the ratchet and let the gear out for the next set. Keep a little tension on the line to keep the mainline clear of the water until the hook section is 300 meters or more offshore to prevent the hook section tangling with the mainline. Then, if there are no boats in the area allow the gear to run out freely. While the gear is setting freely or you are waiting to let it fish cut up the bait ready for the next set. If you are not doing another set get the chilly bin, hand spool and trace rack. Then walk go along the hook section while removing fish and old baits from the hooks before unclipping the trace and putting in on the trace rack. When you get to the end of the hook section wind it up from that end onto the hand spool, remove the float bottle and wind the dropline onto the hand spool and the airbourne mainline onto the beach reel. I normally alternate between hauling down the dropline and mainline every 20 meters or so to avoid getting too much of either in a heap on the beach. I would only advise you to get a Penn Senator if you are going to put spectra line on it, 50 - 80lbs spectra is incredibly good as a kite fishing mainline on a flexiwing rig. It is very light and allows you to fish in lighter winds and keep the mainline clear of the water even when the kite is much further offshore. Recovery with a Penn reel on a rod is the same as above except you wind the line directly onto the reel under load. I use a light drag setting while recovering the dropline to prevent birds nests and this works out very well. Once the bottle is by the reel I simply tighten the drag to stop it running back out. Short stout rods with ceramic eyes are best for kite fishing and a cheap fiberglass one is all you need. Our kite fishing video shows the considerable benefits of putting the reel on backwards when kite fishing but this doesnÕt work as well on rods fitted with roller tips. Next time you are in the shop get rob to show you what I mean on the video. Thank you for the information re the introduction of kahawai into the Quota System. 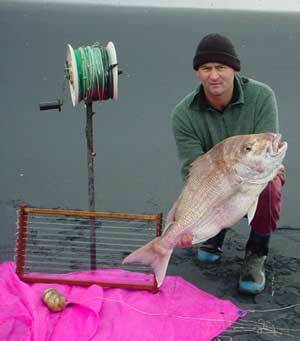 I am sure all recreational fishermen are greatly concerned about this and the present state of the kahawai stocks. I wonder though, how much of the lack of regard for the value of our Kahawai is our own fault. I have so often been hugely disappointed to be at a river mouth, or on the beach when the kahawai are easily taken, and seen the way some people will drag in fish after fish and then just throw them up in the sand to rot. Similarly some will set nets knowing that the bulk of the catch will be kahawai, which again are dumped dead, back in the sea or left on the beach. 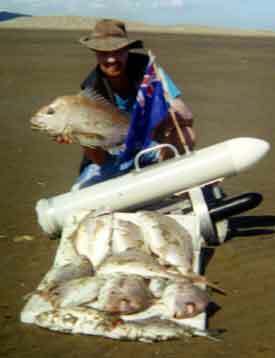 Walk along the beach in April and note the number of beautiful kahawai carcases lying about. Some may have had a strip of bait removed and the rest wasted. Why do so many ignore the principles of not taking more than you can use? Catch and release for a start - very easy if you use longline hooks, which catch just as many fish as conventional hooks, and make release of the fish without injury simple and easy. Why is it that even people who don't go fishing will tell you that "nobody eats kahawai" or that they are only good for bait? Perhaps we should start a campaign to tell people, and among these are some very experienced fishermen, that kawhai can be easily cooked - fried baked smoked - to be as tender, juicy and as full of flavour as any other fish you might catch. I believe that there is an obligation to use what one catches or shoots wherever possible. Why so often we see kahawai being treated as vermin that must be eradicated, I cannot understand. How many children have discovered a love of fishing from catching a kahawai? Let's do something to stop the waste, and learn to value this truly great fish.